We eat breakfast-for-dinner pretty often. I finally tried making beef sausage because it was a breakfast-kind-of-night and I had some beef thawed in the fridge. I used 2 lbs of beef at first and the recipe on page 364 of Nourishing Traditions for Spicy Lamb Sausage, minus the sundried tomatoes and pepper (that I didn't have) and bread crumbs (not on GAPS). And then I mix it all with the triangle-shaped paddle attachment for my kitchenaid mixer. This makes the sausage tougher, which I think is just fine because they stay together better that way. If you don't want it tough, you can mix it all together with a fork. 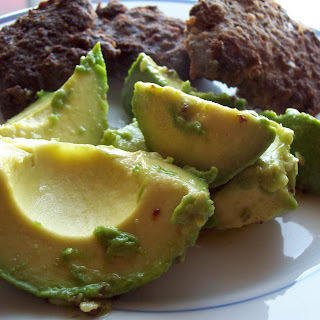 Shape into patties and fry in coconut oil on med to med-high until no longer pink in the center. I love making homemade versions of things that I've only had as packaged food. They taste better and it's empowering once you figure out how to do something that seemed so complicated at first! I don't know a whole lot about spices beyond sea salt, fresh ground pepper, and basil, so this is a new step for me. I'll tuck the sausage into hubby's sandwiches that he brings to work, crumble onto homemade pizza, and just eat as the meat portion of a meal. Falafel with tahini sauce was another meal where I learned a little more about spices. What other spices should I learn to use? 0 Response to "Homemade Beef Sausage from Nourishing Traditions"